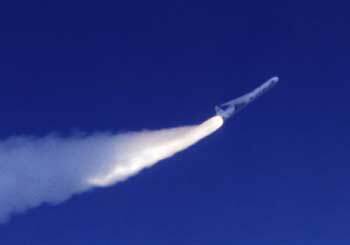 The SORCE satellite was boosted into orbit by a Pegasus® XL space launch vehicle on January 25, 2003 in a mission originating from the Kennedy Space Center, Cape Canaveral, Florida. Pegasus is an air-launched, inertially guided, 3-stage solid rocket capable of launching up to 1,000 pounds into Low Earth Orbit (LEO). 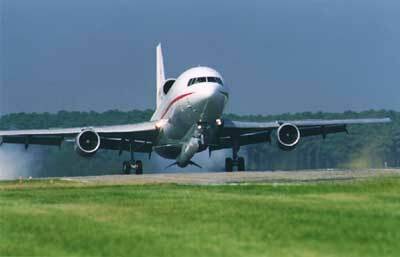 Pegasus is mated to a specially modified L-1011 carrier aircraft and dropped at approximately 39,000 feet. As a result of this patented air-launch system, Pegasus can be launched from virtually anywhere around the globe. To date, Pegasus has conducted 31 missions, launching more than 70 satellites from six different sites worldwide. For the SORCE mission, the L-1011 carrier aircraft dropped Pegasus at a pre-designated launch area over the Atlantic Ocean. The vehicle was in free-fall for approximately five seconds, with its delta wing providing lift, before firing its first stage rocket motor. From drop to insertion into orbit, the SORCE mission launch took about 13 minutes. Beside is the Pegasus flight path for the SORCE mission. The first communication with the satellite was at the ground station in Hartebeesthoek, South Africa.